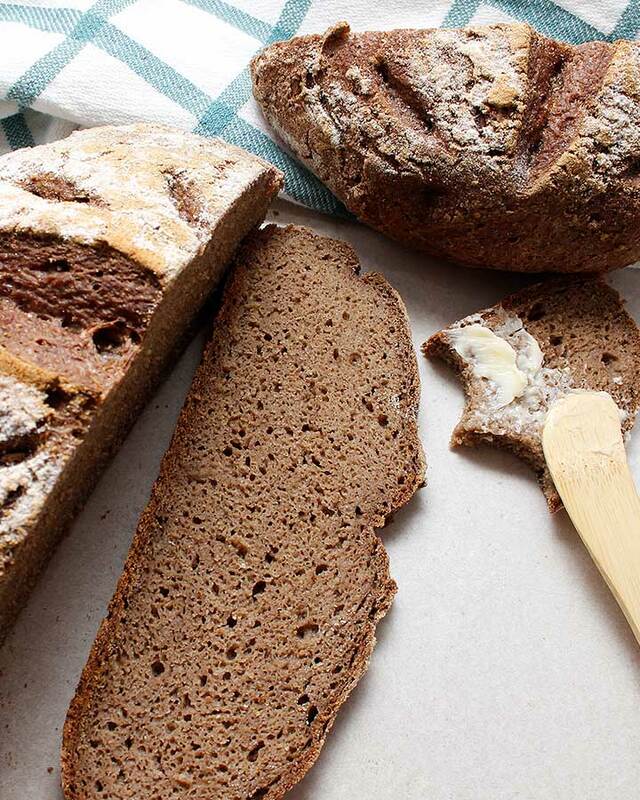 This grain-free bread recipe is the rustic loaf that will change your life! Be excited because it’s also gluten-free vegan, and free of nuts, yeast and gums! If you’ve just switched to a grain-free lifestyle and you have other specific dietary needs—this might be the perfect boule for you to bake! Thank you very much to everyone that has been so kind in sharing some of their dietary requirements. 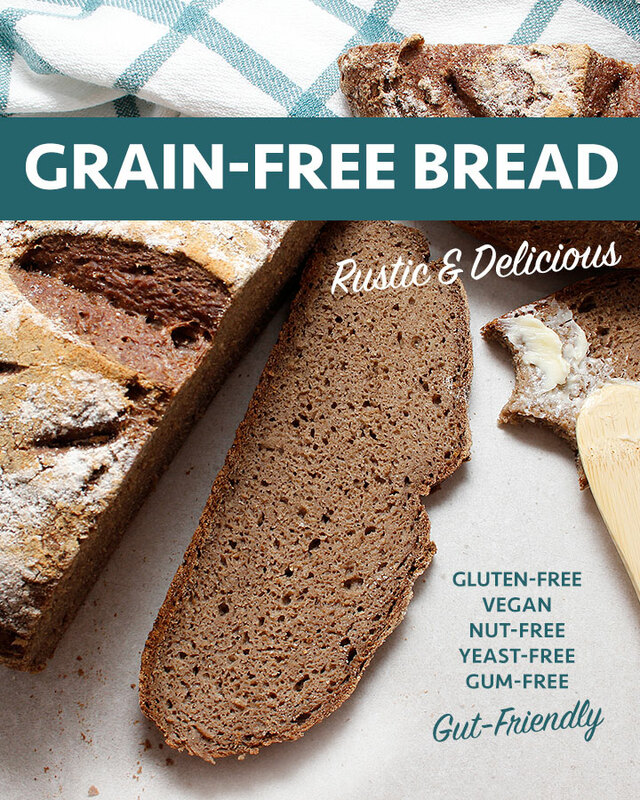 All your input has helped to create this one-of-a-kind grain-free bread recipe! Click the Read More button below to read the full post and to watch the quick how-to video. After doing my research, and reaching out to my members and followers about the ingredients, I’ve come to realize that it’s common for people on a grain-free diet to also avoid yeast, eggs, dairy, nuts and gums. 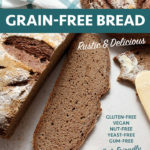 The debate for including buckwheat flour in this recipe was ongoing, but after some deliberation, I came to realize that this pseudo-grain can be tolerated in moderation by many on a grain-free diet which is why I decided to include it. If you avoid buckwheat, I would suggest increasing the other flours in the recipe to replace the buckwheat flour. My challenge when creating recipes is always to make sure they are plant-based, allergen-friendly and nutritious. 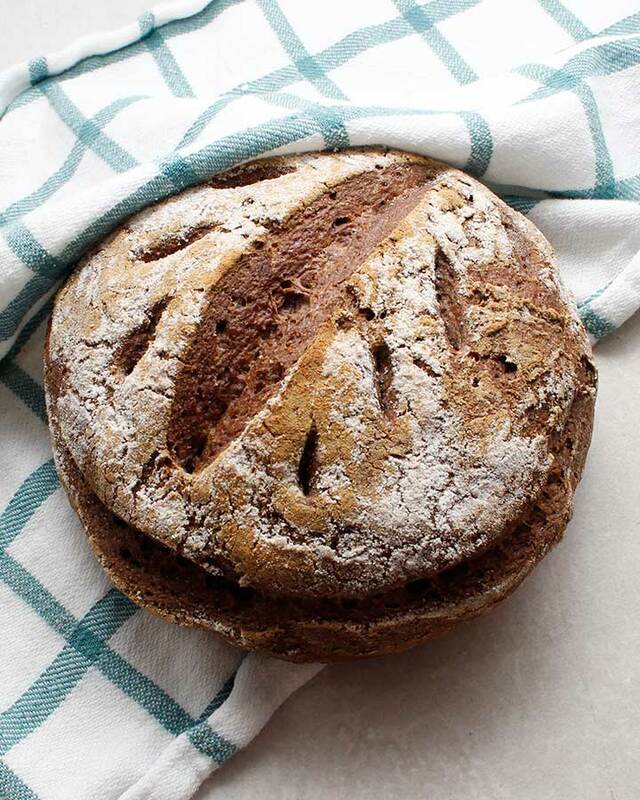 The addition of seeds in a loaf of bread is a bonus, as it helps to create wonderful flavours. I’ve recently started experimenting with whole tigernuts and tigernut flour, and I have to admit that I really love these nutrient-packed tubers. That’s right, tigernuts are not nuts! Whole tigernuts make the best plant-based milk! And, as for banana flour, sometimes labelled as green banana flour, I’m equally impressed. This terrific gluten-free, grain-free flour alternative is a great one to add to your pantry. It contains a great source of dietary fibre, can even help with colon health, and it’s a resistant starch—the better kind for your health. If you experience digestive troubles, like many of us do, soaking your dough mixture overnight can be beneficial. The method of soaking nuts, seeds, grains and flour combos will help to break down the ingredients, making it easier on your gut to absorb nutrients. Refrigerating your dough mixture for twelve hours should be plenty. Please note that if you end up soaking the mix for a little less, or a few extra hours, because of time constraints (or because you’re excited to bake your loaf), it should be just fine. Initially, I really wanted to share this bread recipe as a grain-free fermented sourdough. After various trials, I decided that for beginner bakers this might not be the easiest of methods to start with. If you do have a lot of gluten-free sourdough baking experience, then go ahead and create a wild yeast starter with any of the grain-free flours in this recipe. It will work, but it does take up to 7 days to develop a bubbly grain-free sourdough starter. 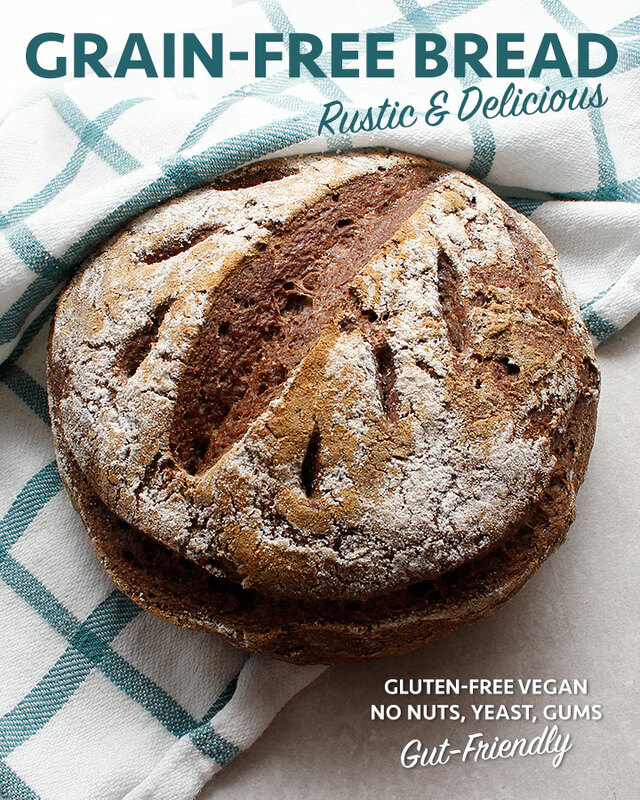 You can use the Gluten-Free Sourdough Starter recipe to guide you along the way. One more thing, baking this recipe as a sourdough will require a slightly different prepping method. Although the slow overnight soaking/fermenting of the ingredients will work equally well for this version, an additional proofing/rising period of approximately 2-4 hours would also be required. Please leave a comment below if you need more guidance with the grain-free sourdough option. If you do like the idea of creating a sourdough, but you don’t want to wait up to 7 days, you can add a little active yeast to speeds things up. This won’t create a true grain-free sourdough, but it will yield a very satisfying and tasty loaf. I usually combine 1/4 of a teaspoon of active yeast, 1/2 cup of water, with 1/2 cup of flour. Stir, cover and let sit on the counter at room temperature. You’ll feed the quick starter 1 to 2 more times until you get at least 1 cup of bubbly starter to use in a bread recipe. Adjusting the measurements of the dry ingredients would be necessary if trying this recipe as a quick sourdough. Again, I can elaborate with more instructions if this method interests you. Just let me know in the comments, and I can create a new post or include more instructions here. You might be wondering if you can bake this loaf without baking powder. Well, the baking powder in this recipe is sort of the magical ingredient. The baking powder used in this recipe includes; tapioca starch, cream of tartar and baking soda. This is the brand of baking powder I use—sometimes I make my own. In a pinch, you could probably omit the tapioca starch as the recipe includes arrowroot starch, but you would have to replace the cream of tartar with either apple cider vinegar or fresh lemon juice. The addition of a little baking soda might be necessary. Baking this grain-free loaf without baking powder wasn’t tested. Once it is, I will add the details in this post to let you know of the outcome. I’m curious too so it will be tested again at some point, as I bake this loaf very often—it’s that good! Just wait until you smell it baking! You’re here now, so try it! You can ask questions along the way in the comments below or join Fresh is Real’s GFV Baking Facebook group. New gluten-free cookie course self-paced course from GFBA. My last recipe on Fresh is Real was a beautiful, comforting Butternut Squash Leek Soup! Enjoying a slice of grain-free toast to dip in this soup is very delicious! The Gluten-Free Sourdough Starter recipe post was recently updated with new videos and a printable pdf which includes a step-by-step guide on how to make your own starter. If you attempted this grain-free bread recipe, I’m very proud of you! You did it! You baked yourself a rustic and delicious ball of goodness! Share your success by taking a picture! Post it on Facebook or Instagram and tag it #freshisreal #gfvbaking. Lastly, don’t forget to rate your experience below. 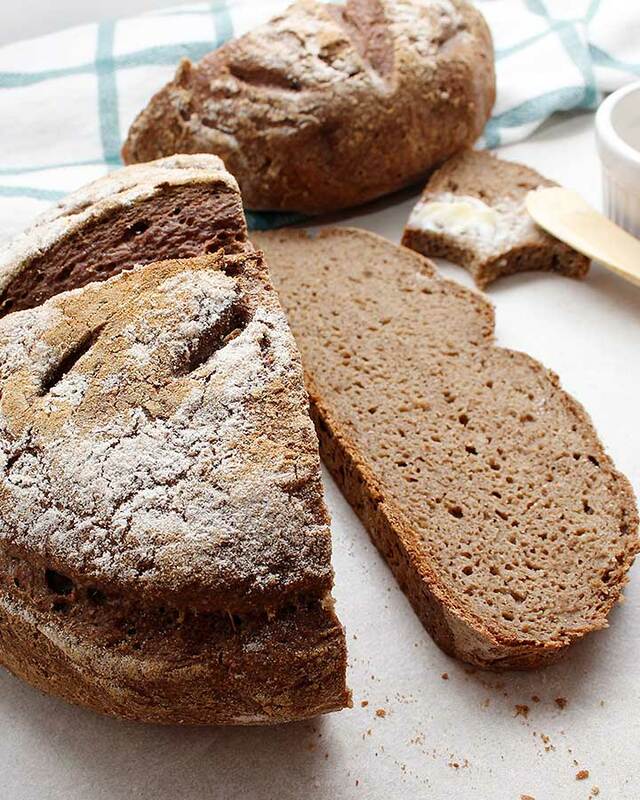 Leaving a comment is very helpful to others attempting their first grain-free bread recipe! Looks wonderful! Thanks for making this recipe. Can you include the baking powder recipe please because I don’t have that one here. Could you include how much bi-carb and tapioca and vinegar to use if just have baking powder as you mentioned? I also can’t get tigernut flour here. Would cassava be a good substitute? Can the buckwheat be swapped for almond meal? Thank you! Hi Nereda! Here’s the baking powder* recipe: Combine in a small glass jar; 1/4 cup cream of tartar, 2 tablespoons baking soda with 2 tablespoons tapioca starch. Mix, cover jar and use as you would regular baking powder. If you don’t have cream of tartar and would like to use apple cider vinegar or fresh lemon juice, I would try combining 1/2 tablespoon baking soda, 1/2 tapioca tablespoon tapioca starch (or leave the starch out as you have starch in the recipe) with 1 tablespoon of vinegar or lemon juice. If you don’t have access to tigernut flour and can consume almond meal, you can sub it 1:1. 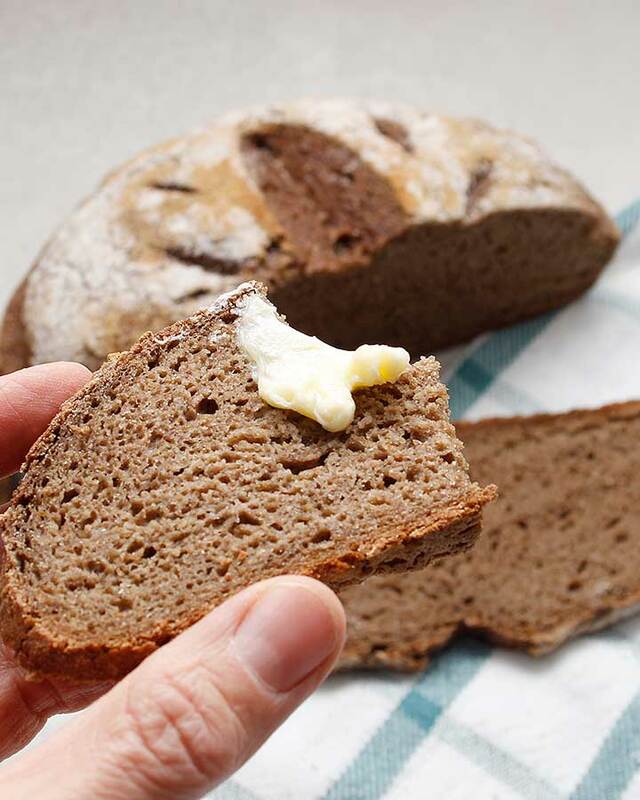 Yes, you could swap the buckwheat with almond meal or flour but if you swap two ingredients with almond meal/flour that means your loaf would only have the green banana flour and almond meal? Or would you keep the sunflower seed flour in too? I don’t want to guess, because I haven’t tried such a version myself, but if you make this loaf with a simplified combo of almond meal, banana flour and include arrowroot flour along with the psyllium, palm sugar, salt, baking powder and water, I think it should work. If you do test it, please let us know how it turns out! *Gluten-Free, Corn-Free, Aluminum-Free. Hi Stephanie! I’m so happy that you tested the grain-free bread recipe! It’s a very unique loaf and it makes me smile knowing that you enjoyed it as much as I do! If you have a minute do you mind rating the recipe at the bottom of the recipe post? I would appreciate that very much! Also, let us know if you made it as is (other than increasing the size) or if you made modifications to the ingredients.